Luke Karakas ’19 (left) takes the ice with his father, Kipp Karakas ’88. Luke Karakas ’19 has played hockey most of his life, a good portion of it on teams coached by his father, Kipp Karakas ’88. The younger Karakas is thoroughly enjoying his time on a St. Norbert College men’s hockey team that features his dad as an assistant coach. Luke plays right wing while Kipp coaches the goaltenders – a position Kipp himself once held in club sport days at St. Norbert. Luke’s post-high school hockey career took a typically circuitous route across North America’s junior hockey ranks before he landed a spot on the University of Wisconsin-Superior’s roster for his freshman season of eligibility. He found himself the odd man out on an overloaded roster his sophomore season, and at his father’s suggestion, Luke called Coach Tim Coghlin to inquire about a roster spot. At first glance, hockey and golf appear to have little in common. One is a fast-paced, physical team sport played on ice; the other a leisurely, non-contact, individual sport best enjoyed on a warm day. But Luke Karakas ’19 proves that some skill sets do cross over. Out of the tightly knit collegiate hockey coaching fraternity, former University of Wisconsin star Andy Brandt joins St. Norbert College as associate coach for a Green Knights squad that has advanced to the Frozen Four 11 times since 1997 – including four Division III national championships. 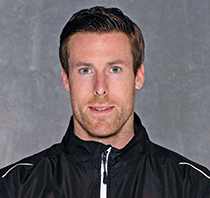 Brandt, a member of the Badgers’ 2007 Division I national championship team, played professionally for the Atlanta Gladiators (the Boston Bruins’ East Coast League affiliate) and served as that franchise’s coach and general manager for the past two seasons prior to coming to St. Norbert.